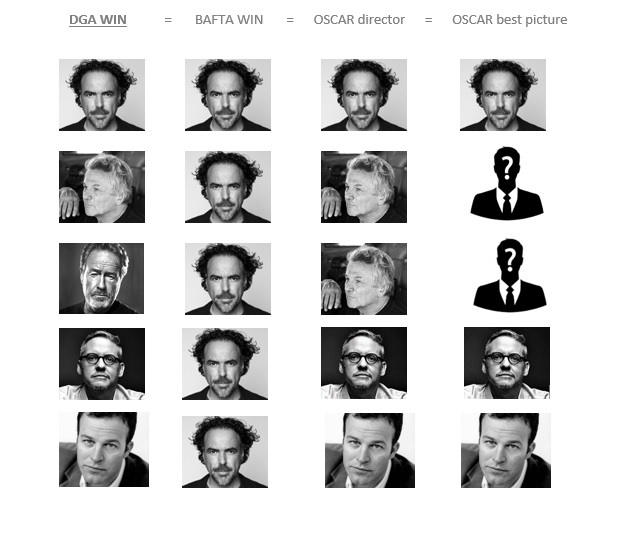 Explaining what DGA means this year in terms of Oscar ramifications. In a near unprecedented year where no one seems to have a clue, with this crazy awards race, how things are going to shape up, I am going to provide some “If this – then This” predictions that should make things slightly more understandable. FYI, the DGA winners will be announced via twitter late, very late Saturday night, usually around midnight CST. It’s a private, star studded ceremony that goes on forever. 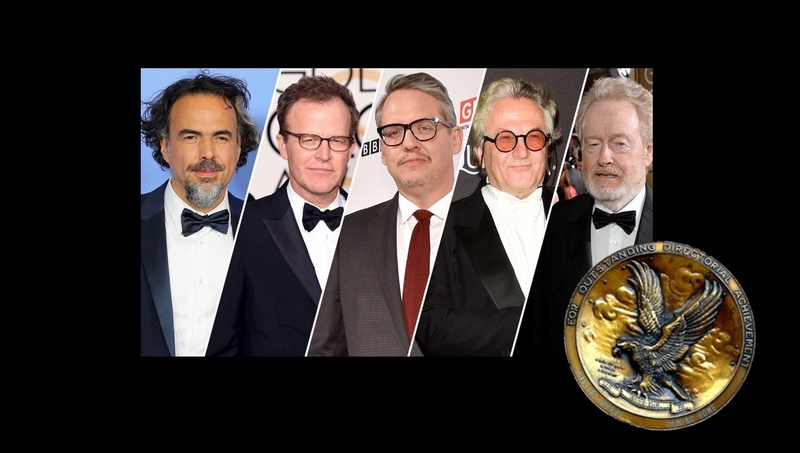 Alejandro González Iñárritu (The Revenant) – If the Mexican director wins Saturday night at the DGA, it will be the first time a director has won back-2-back. Iñárritu of course won last year for Birdman, tipping the scales not only to win director weeks later at the Oscars, but advertising Birdman would also take best picture, which of course it did. If he hadn’t won last year, I wouldn’t be writing this article, and we would all be placing our bets behind arguably the most fearless and envelope pushing mainstream director working today. However, IF Iñárritu wins THEN The Revenant becomes the new front-runner to win best picture at the Oscars, and Iñárritu making history there winning back to back also. It would also greatly increase the odds that next week The Revenant and Iñárritu would win the BAFTA, which might be the case regardless if he wins DGA or not. George Miller (Mad Max Fury Road) – People might not be talking about Miller’s difficult/grueling shoot in the desert like The Revenant‘s high profiled difficulty, but the creation from vision to screen that is Mad Max is equally impressive. Miller is beloved through the industry and at 70-years-old his winning the DGA might be more of a lifetime achievement honor. Miller’s popularity in television is also significant since many of the voting member directors in the branch are from television. Another element in favor of Miller winning, not only that his biggest competitor Iñárritu won last year, is the fact the winners typically come from a technically difficult film. IF Miller wins, as most are predicting, it will provide no more clarity to this years race, Then likely increase the amount of accolades Mad Max will get at the Oscars, including director. While Mad Max is the least likely to win best picture among the 4 front runners, it’s certainly not impossible and a DGA win would certainly increase the probability. Ridley Scott (The Martian) – Here is where things get interesting. All season long Ridley Scott was the assumed front runner to win best director, he’s never won after such a long career, The Martian was a huge hit, it would be a chance to make up the snub for Gladiator. But then after getting the DGA nomination, he wasn’t included in the five nominees at Oscars. Scott is also very popular with the television directors as he produces many TV series, but what works against him, besides his prickly British personality, is his background as an engineer not an artist. Even in interviews he talks about how easy The Martian was to film and execute. He is also the only director among the DGA nominees who did not also write the screenplay for his film, many believe this is what knocked him out at The Oscars in favor of Lenny Abrahamson who like his fellow nominees, penned the screenplay for Room. However IF Scott wins DGA THEN it’s even less clarity for this years awards race, it would also be a big FU to the Academy for snubbing him. Another thing working against Scott is the piles of terrible movies he has made in between the good ones. Tom McCarthy (Spotlight) – Mostly known for his witty indie screenplays, even an Oscar nominated writer for the animated picture Up. McCarthy is being praised for his screenplay on Spotlight, he is even the front runner in the original screenplay category, and there-in lies one of his biggest obstacles as a director. First of all, why give him DGA when when the Writers Guild of America (WGA) is going to give him their award, and he will likely win the Oscar for screenplay, spread the love around right? Second problem, Spotlight as a film is entirely about the dialogue, and not taking anything away from McCarthy’s talent, but comparing the skills needed to pull off Spotlight versus the cinematic feat of The Martian, The Revenant and Mad Max as far as technical ability goes, he seems like the weakest contender here. His third problem is that McCarthy wasn’t nominated for best director at BAFTA. However the recent SAG and Critics Choice victories for Spotlight certainly show strength for the film, IF McCarthy pulls a big upset winning DGA, THEN it’s over folks and Spotlight will easily win best picture at BAFTA and Oscars. This is literally the least like scenario of the DGA evening.